Everyone’s blogging about the new White House dog, Bo (aka Bo Obama, Bobama, Amigo’s New Hope) so we decided that since we’re blogging dogs, we probably should too. We’re excited for Shasha & Malia – we think every kid should have a dog, so congrats! Bo is a cutie. 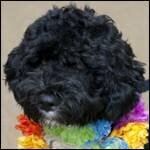 According to the AKC, Portuguese Water Dogs are an intelligent, athletic, active breed requiring daily vigorous exercise. It’s a good thing Bo has plenty of long hallways to run in along with that big grassy yard! Our Favorite Bo-Related Tweet: “@inkfoundry: How long before Bo Obama ends up in the White House water fountain?” lol. The breed was initially created as a coastal working dog herding fish into nets, retrieving lost tackle & broken nets, and acting as a courier from ship to ship or ship to shore, so probably not long. The Obama family seems to be getting a lot of crap (pun intended…this is a dog blog) because they didn’t go with a rescued dog. According to this nice little article, Bo originally belonged to another family and was returned to his breeder because the other dog in that family didn’t get along with him. Bo was then placed with his second “1st” family, the Obamas. This, in my opinion, is a great example of a responsible breeder. The breeder didn’t let Bo’s first family turn him over to a rescue, shelter or pound when they realized it wasn’t working out. They took responsibility for this little life they created, took back the puppy, and found a new home for him. I also think this makes him a rescue of sorts. Had he not been bred by a responsible breeder, this is exactly the type of situation that would have resulted in the puppy ending up at a shelter. So, congratulations to Bo on finding your family! We hope to see you on twitter. Congratulations to Bo’s breeder for doing the right thing by taking back your puppy when his family couldn’t keep him and finding him a new home. Finally, congratulations to the Obama family for not only finding a responsibly bred and rescued dog, but for taking your time and not rushing into the process of adopting a puppy. We feel so fortunate to have found him. We also are doing a lot of work to socialize him and also help him overcome his separation anxiety. I’ve discovered the latter is common in dogs who go from multi-dog homes to being the only dog.